As someone who works and frequently plays in the Mile Square, I come across panhandlers every day. They include the “physically disabled” woman outside of Starbucks on Monument Circle who manages to haul around a shopping cart full of her stuff, the guy who has been trying to get enough money for gas so he can get his family stuck on the Eastside to Memphis, and the two guys who are “broke and homeless” but talked about their cellphone plans when they didn’t think anyone was listening. . . . I decided to take matters into my own hands. 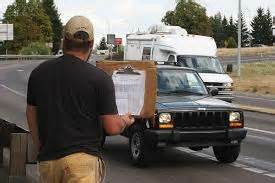 I decided to turn the tables on the panhandlers and start asking them for money. It was a fantastic experiment. . . .
What fascinated me the most was the fact that people who spend all day begging others for money had the nerve to get mad when someone did it to them.